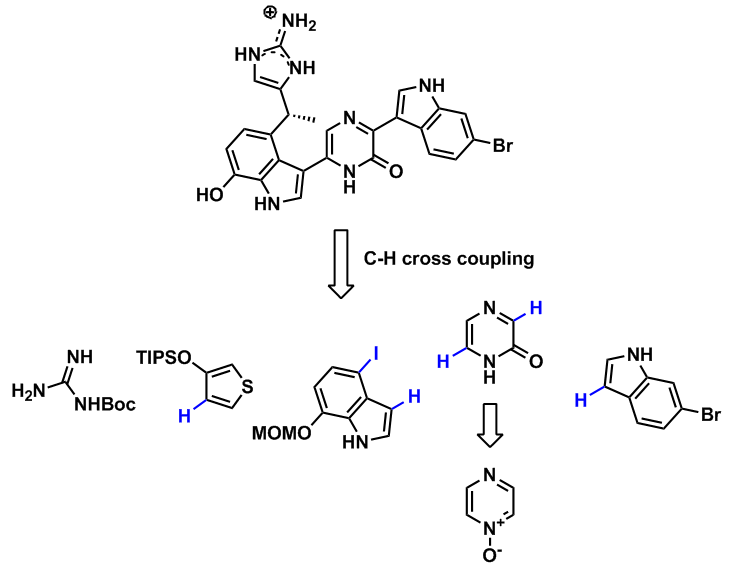 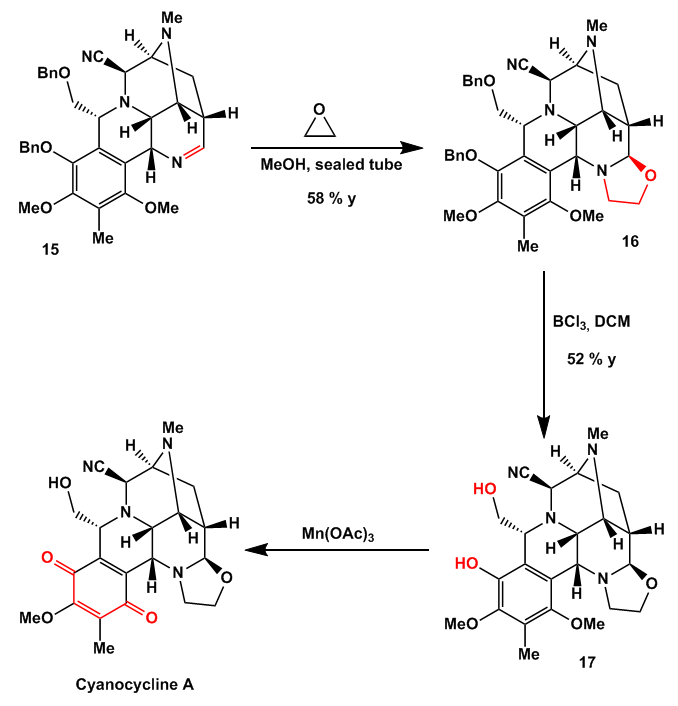 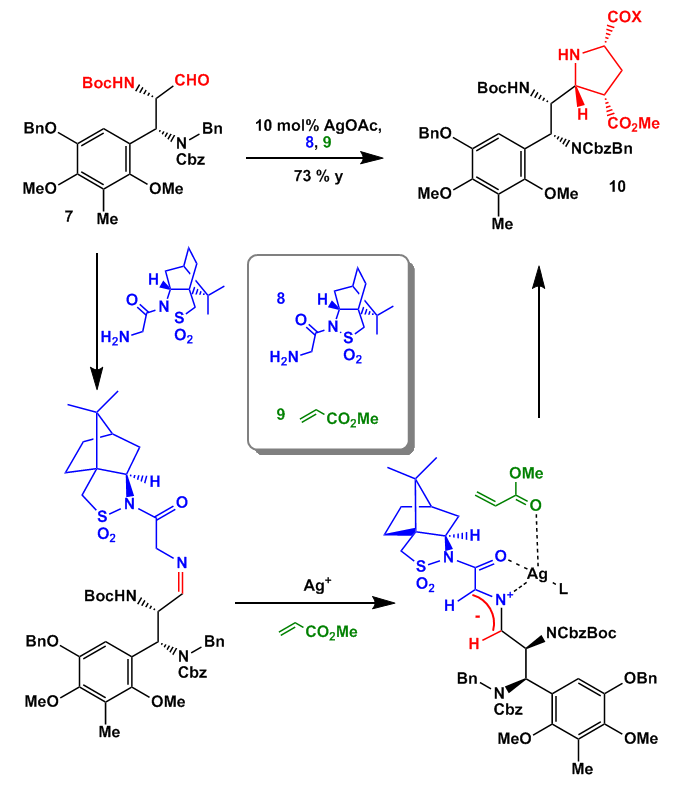 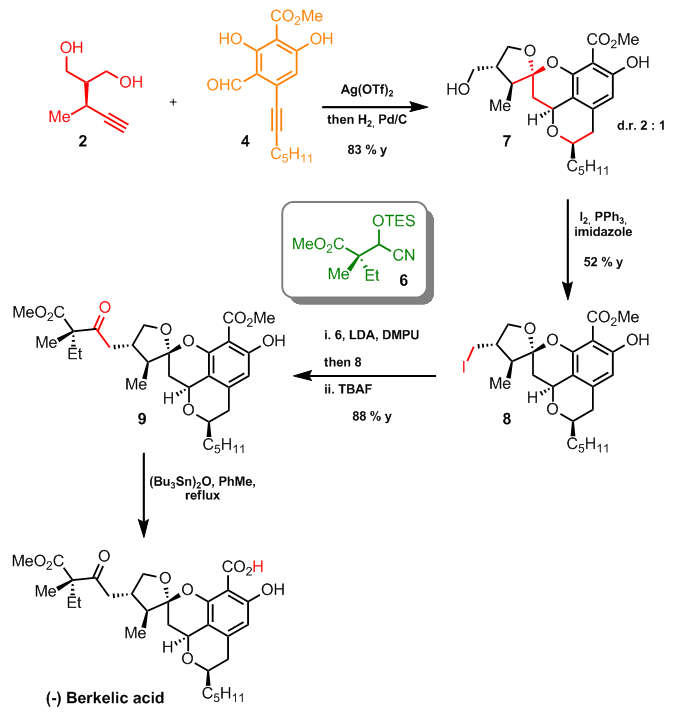 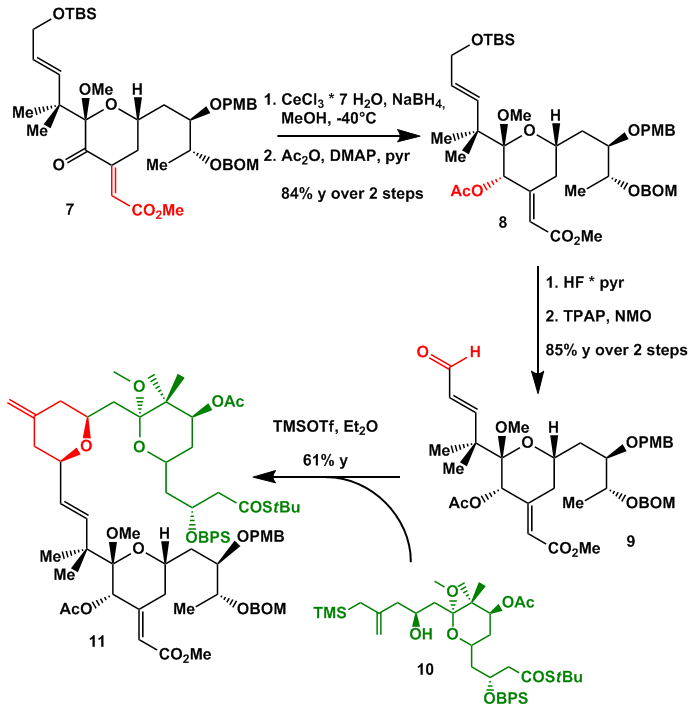 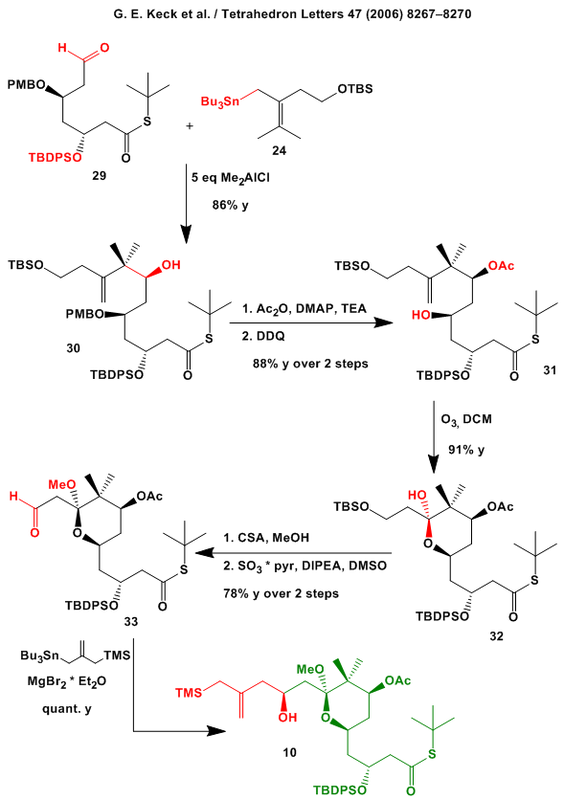 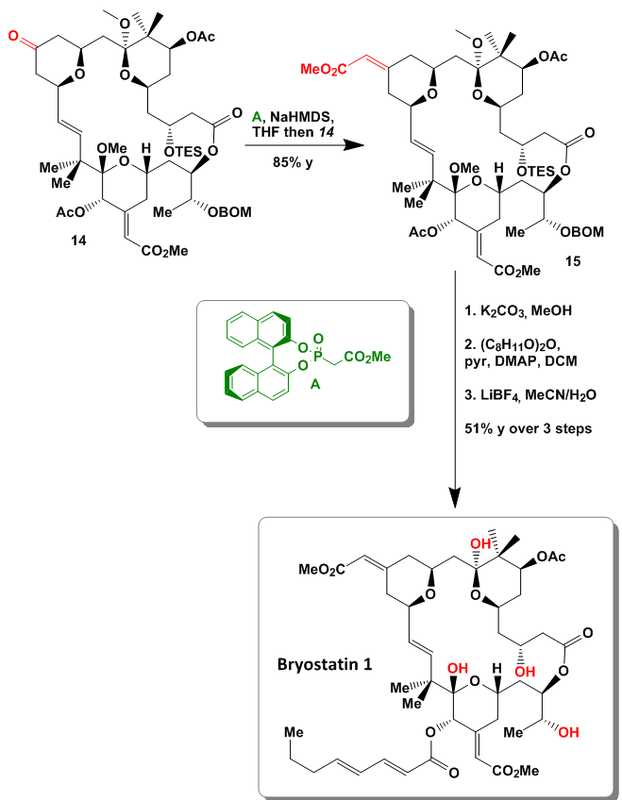 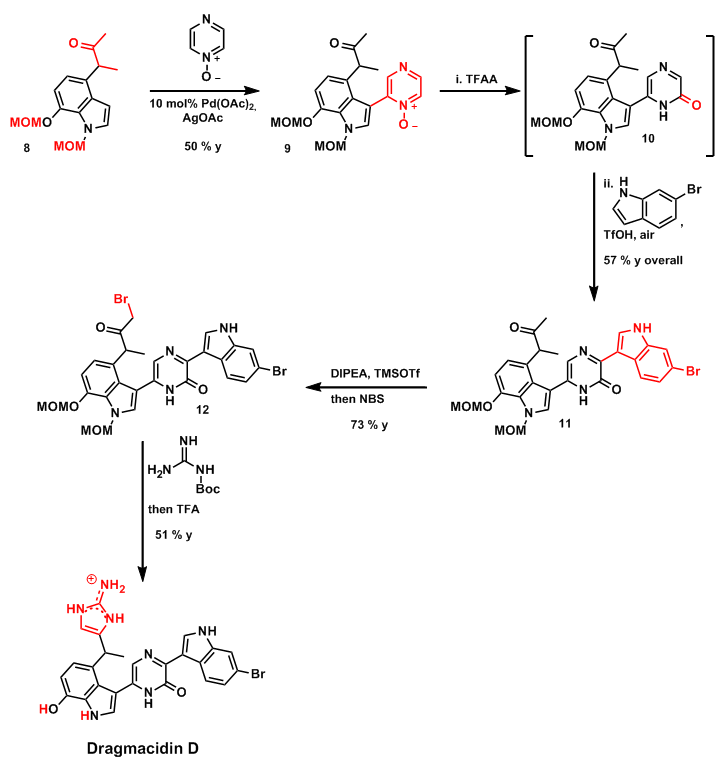 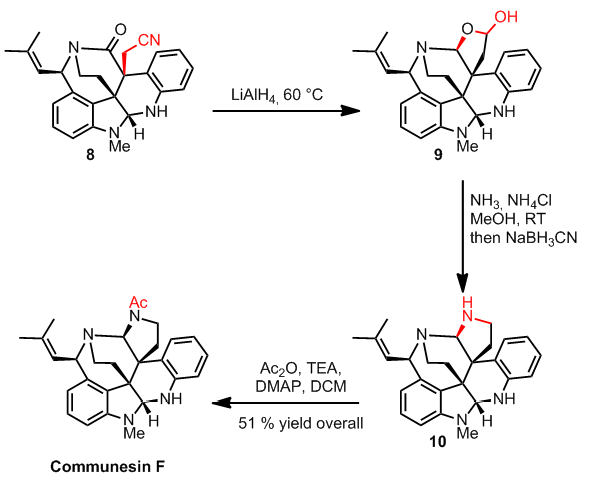 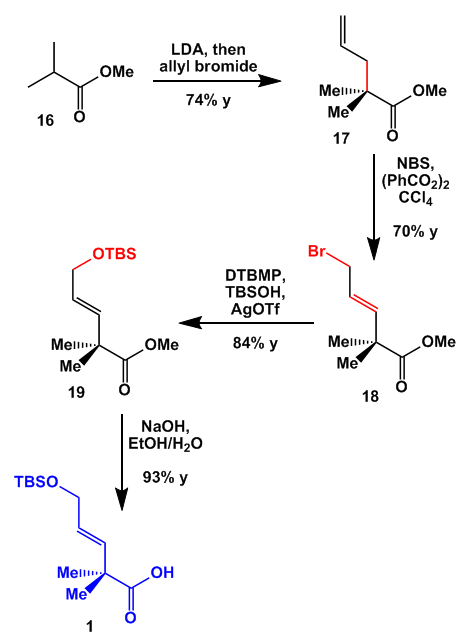 … so I chose a synthesis from the De Brabander group published in July. 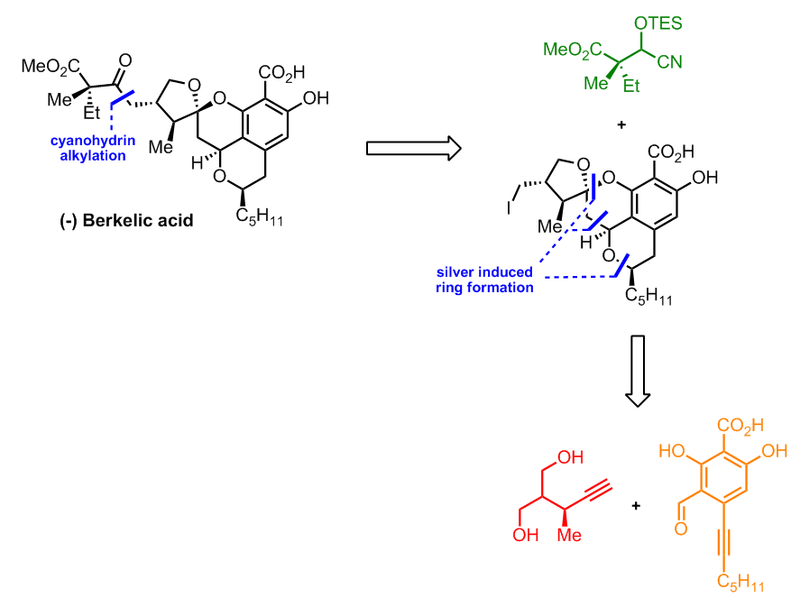 Berkelic acid possesses selective activity against human ovarian cancer cells so a support of synthetic material is needed for further studies. 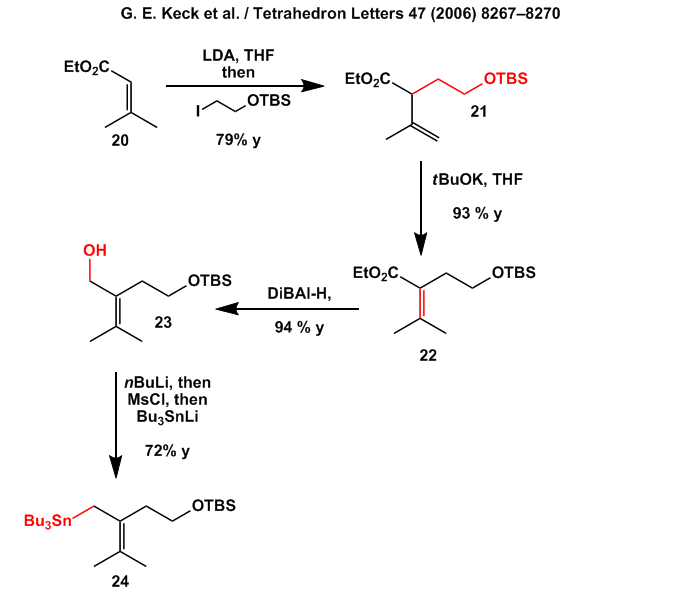 Interestingly the true structure of berkelic acid was unknown until the synthesis from the Snider group in 2009. 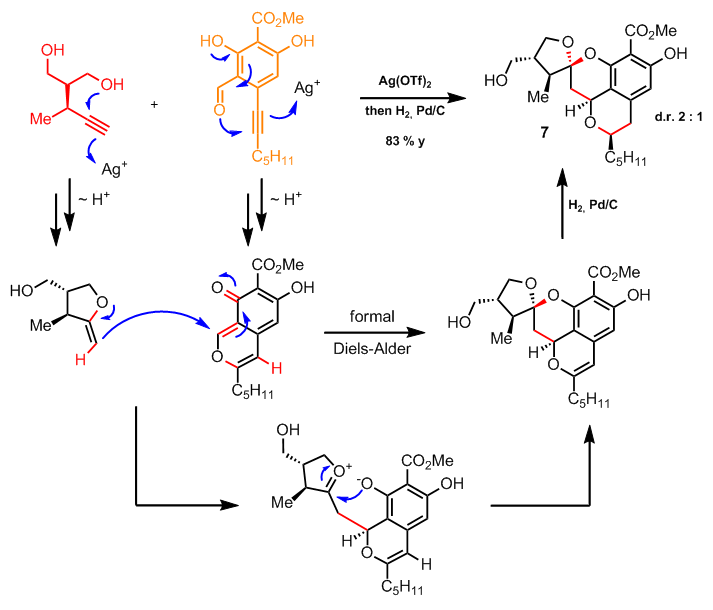 To shorten my review I will focus on the key step but discussions about specific reactions are welcome (I’m still trying to improve my style). 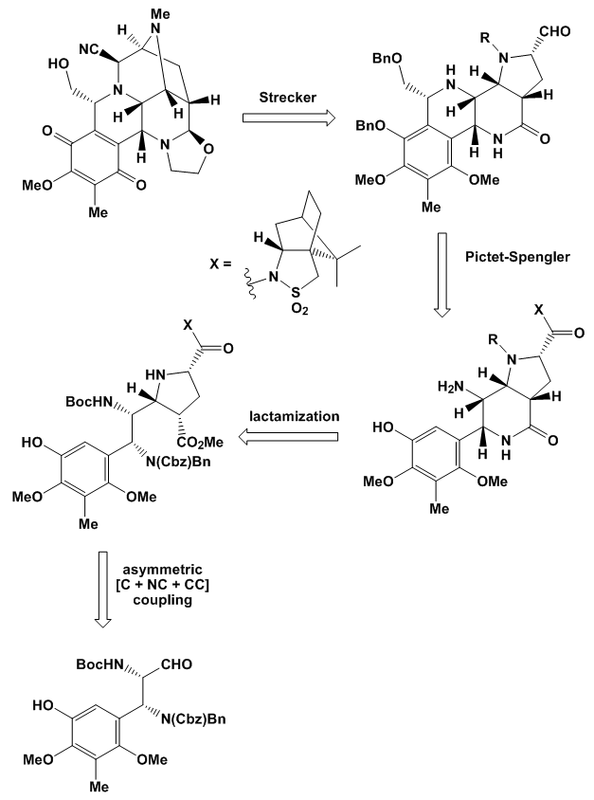 The group recognised the fact that berkelic acid might be formed by a DA reaction of the already known compounds spicifernin and pulvilloric acid whose total syntheses were published some years ago. 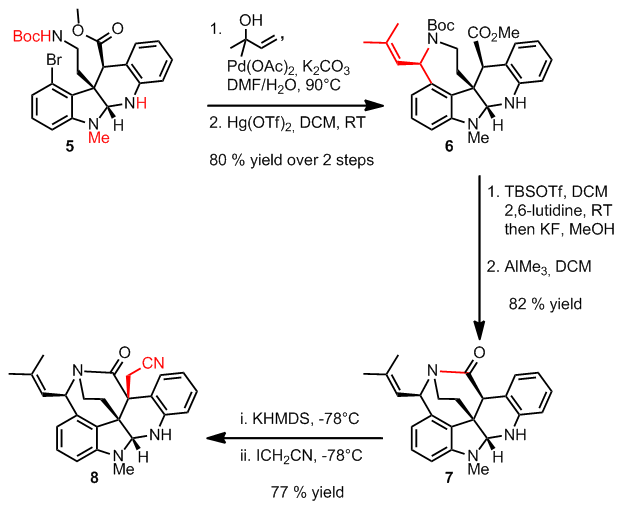 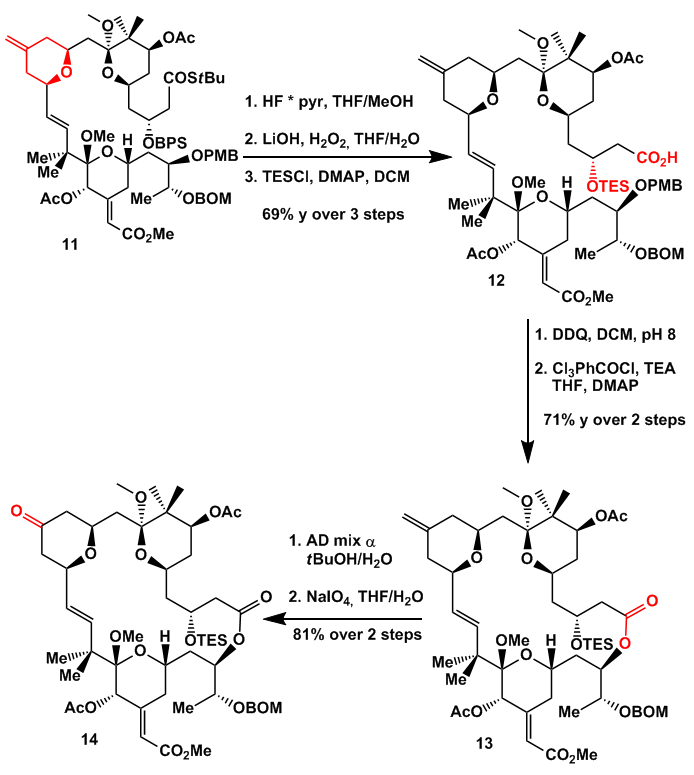 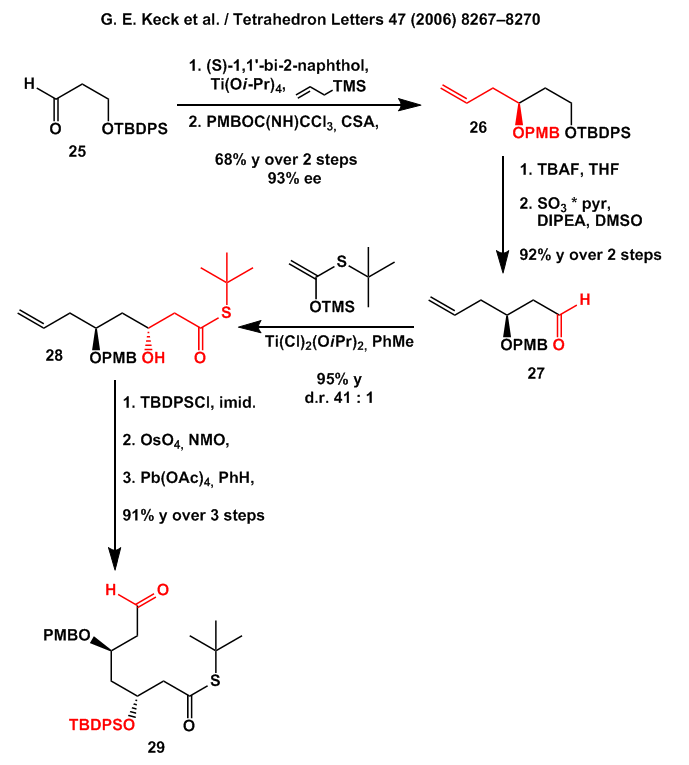 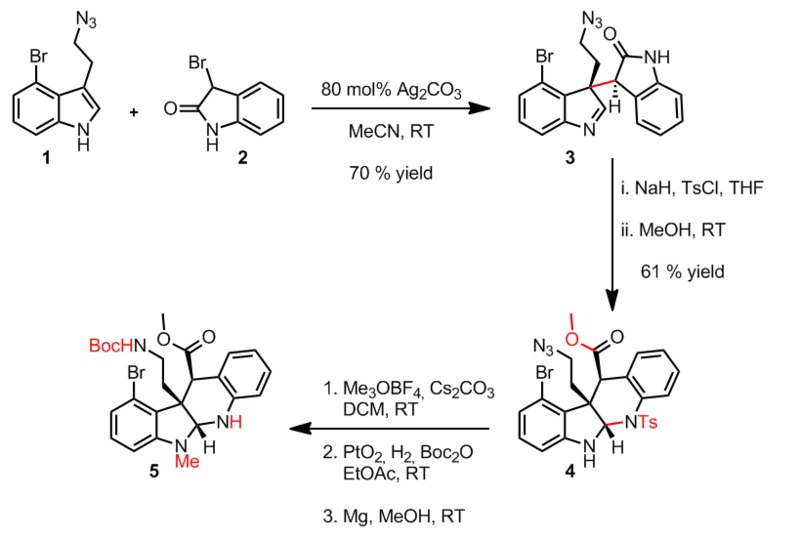 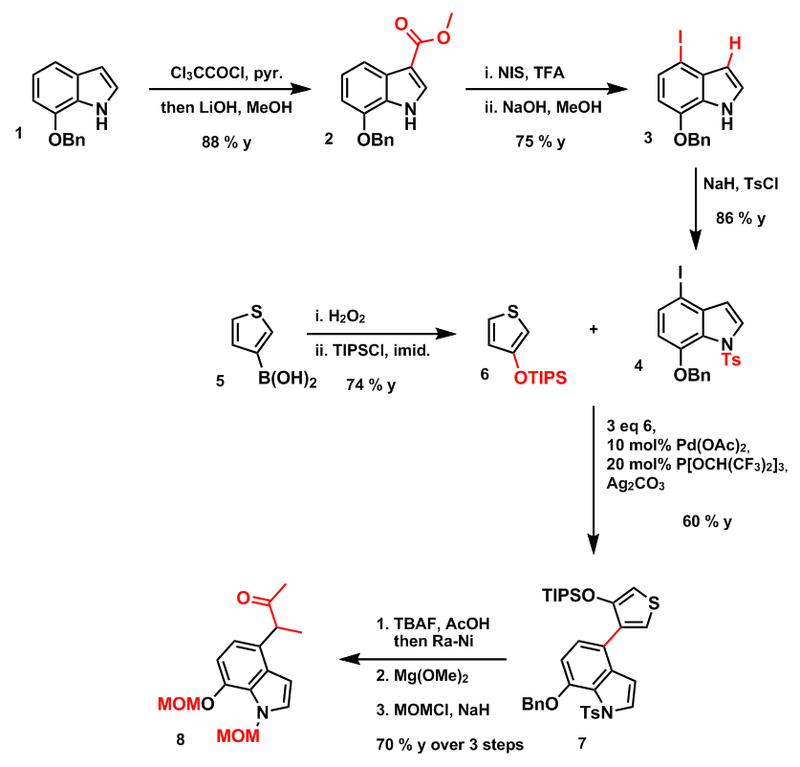 A tBu-Valine enamine directed alkylation was followed after hydrolysis by a TiCl4 promoted aldol reaction giving the required α-β-unsatured ketone. 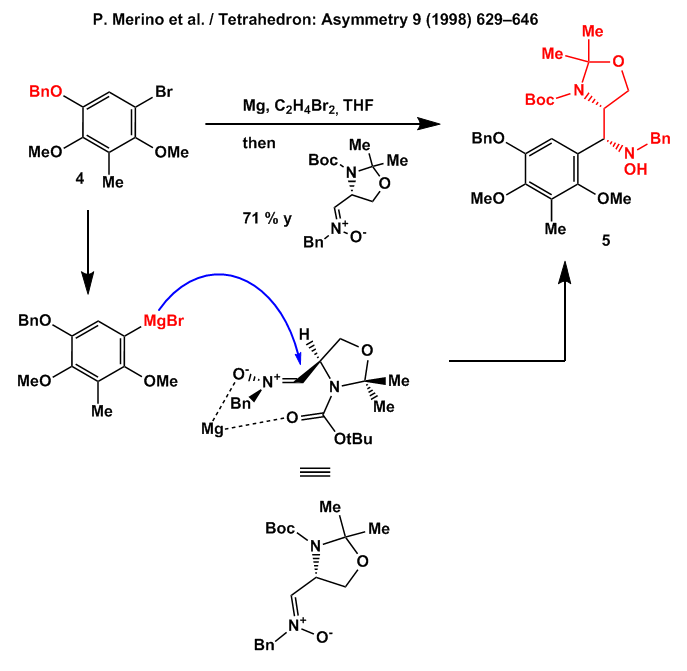 A copper catalysed, anti-selective Michael addition with TMS-butyne, TMS and PMB-ether cleavage then gave the red fragment in good overall yield. 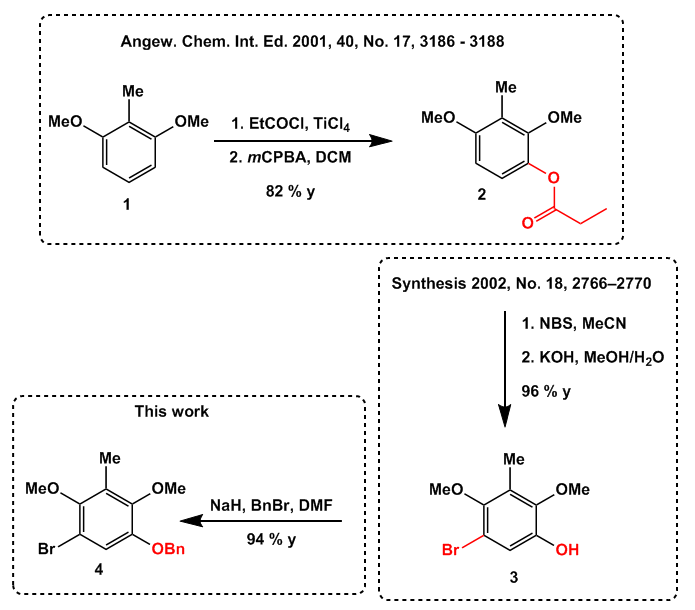 A regioselective triflate formation/Suzuki-Miyaura reaction yields the symmetrical bis-hydroxy acid which was protected as the MOM-ether, epoxidized and hydrogenated at the benzylic position to give the racemic alcohol shown. 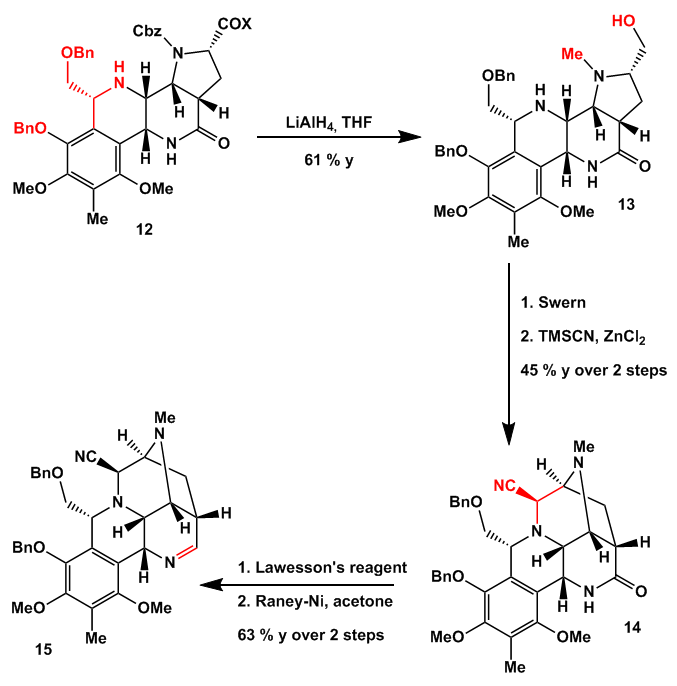 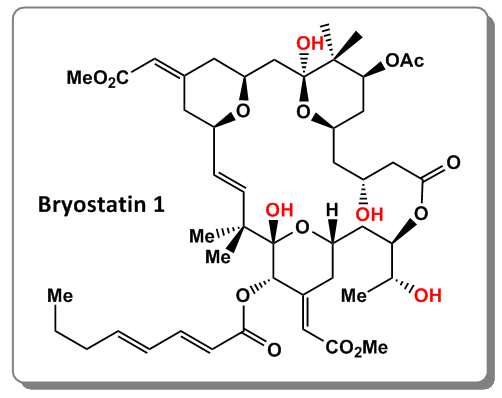 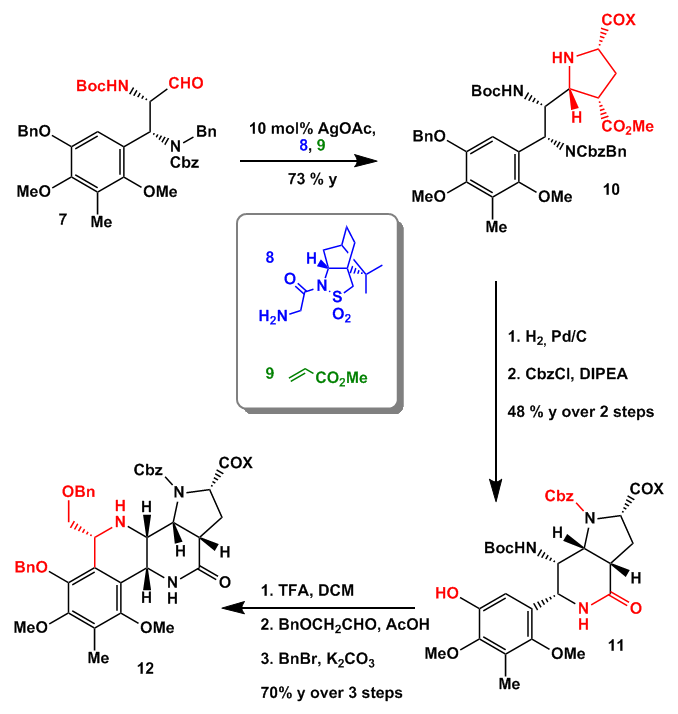 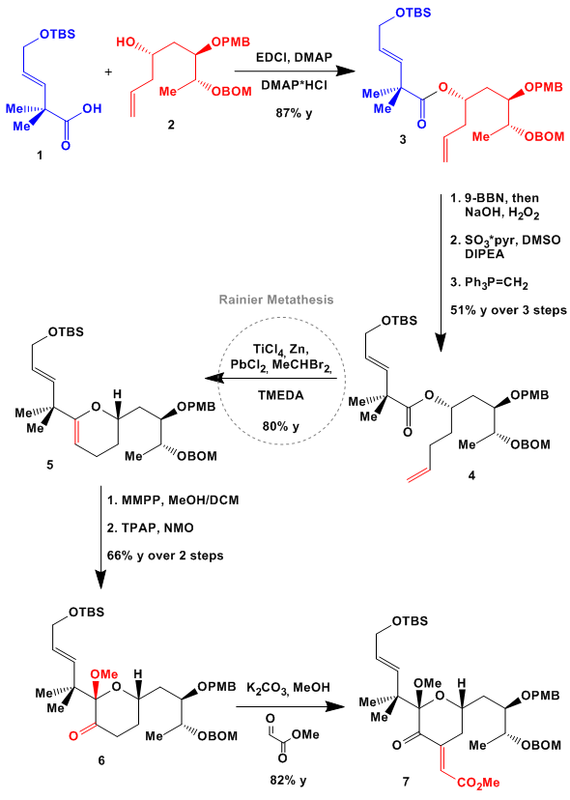 Stereoselective Lipase catalysed acetylation of the R-alcohol and Mitsunobu reaction of the other enantiomer gave the required fully protected dihydroxy benzoic acid. 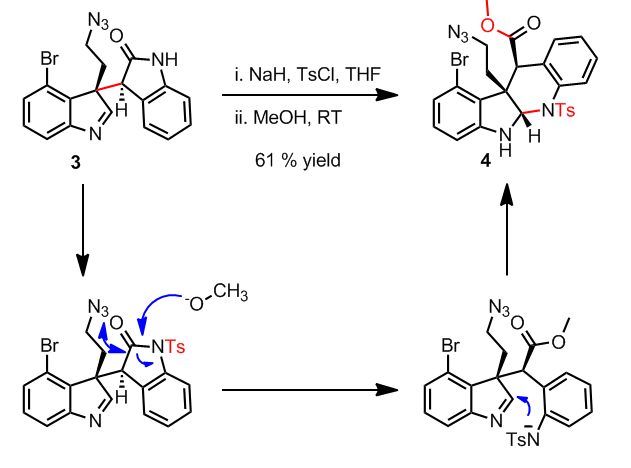 Deprotection and exposure to TEOF/TFA yields the blue fragment through an oxo-Pictet-Spengler reaction again in an overall excellent yield. 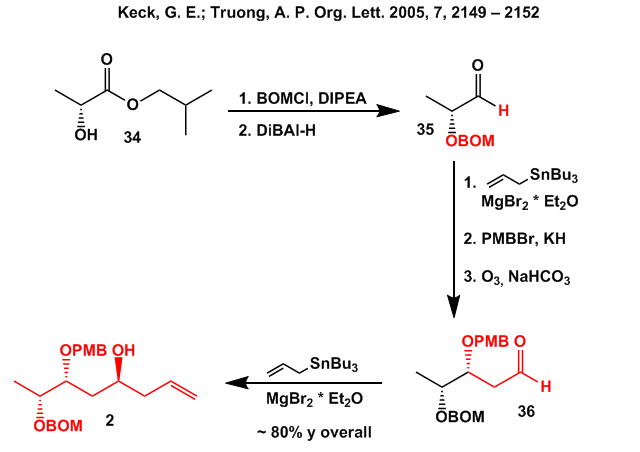 Combining the 2 fragement in the presence of AgSbF6 produced berkelic acid methyl ester and additional diastereomers which could be separated after deprotection with (Bu3Sn)2O. 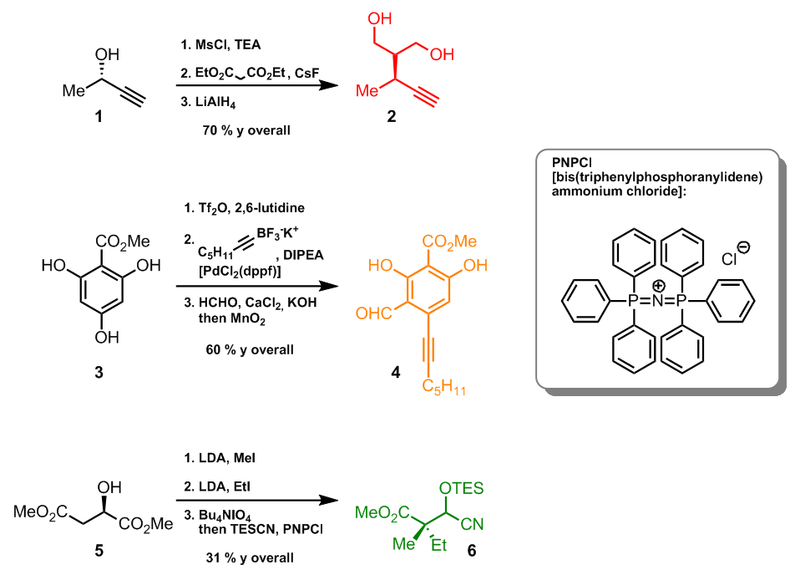 The first equivalent produces the exo-methylene tetrahydrofuran, the second equivalent acts as a Lewis acid and oxidises the aromatic ring by cleaving the ethyl acetal. 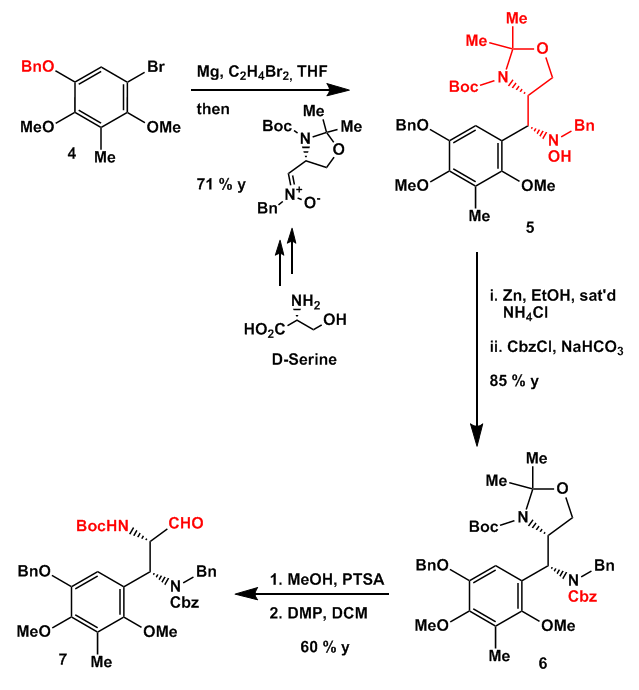 After formation of the required quinone methide the third equivalent catalyses the [4+2] addition yielding berkelic acid as the main diastereoisomer.